East Lake School students were given a motivational speech they will remember for the rest of their lives on Nov. 26. 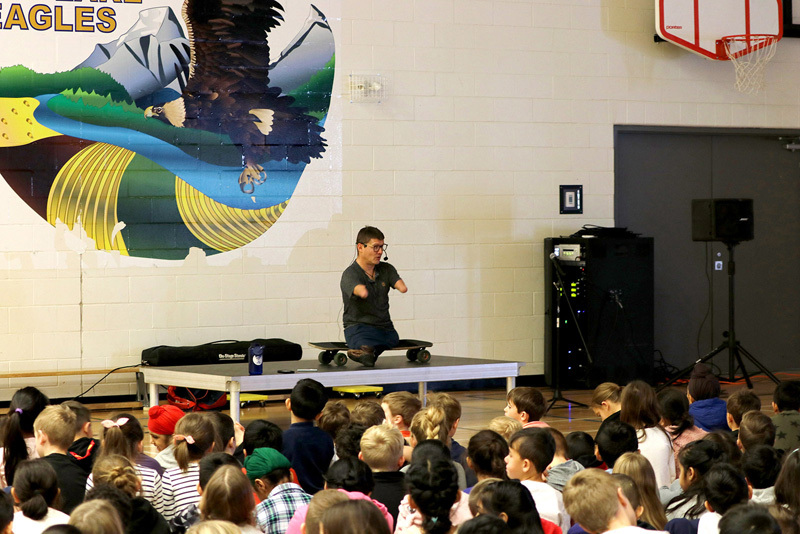 Chris Koch, an Albertan farmer, world traveler, and adventure seeker who was born without arms and legs told grade one to grade four students that what others might see as limitations, they can see as opportunities. “It’s so much fun, it’s pretty rewarding, on a simpler level with the younger kids it’s showing them what I’m able to do, and educating,” Koch said. The motivational speech went well, Koch added, it can be challenging at times speaking to the younger grades. “The fact that I’m missing arms and legs is such a distraction, you just try to have fun with it. “I could sit in a room full of kids for two hours and still not answer all of the questions they have,” he said. It’s important for Koch that younger students know it’s OK to ask questions, it’s OK to not be shy or afraid, and it’s OK to be curious he said. “If a guy without arms and legs can do pretty cool stuff, then they’re capable of doing some pretty cool stuff too,” Koch said. Koch has been speaking at schools for the majority of his life and has made a full-time career out of it. He hopes students realize that they can do a lot more than they realize because of his motivational speech. “On a more complex level with the older grades, it’s about making the most of whatever situation,” Koch said. He added, “I was born missing arms and legs, some may see that as unfortunate situation, others will see as an opportunity to make the most of whatever situation they find themselves in. Koch now is combining his two passions of world travel and motivational speaking. “I love traveling. If one day I can say I’ve been to every single country in the world that would be awesome. Koch added, he doesn’t want to be speaking about the same thing 10 years from now. Although Koch has been on many memorable adventures, a highlight for him was riding his skateboard along the Trans-Canada Highway and making his way across the country in 18-days through the kindness of strangers. “That was one of the cooler adventures I’ve ever done,” Koch said. It was important for Chris Koch to speak at the East Lake School because of the message he brings, said Principal Jordan Fenton. The message Koch brings is one of resiliency, and one of looking at our lives as what we can do rather than what our limits are, Fenton said. “My hope would be that students think of all the possibilities they have in their lives and reach for their dreams,” Fenton said.